For those who have notebooks or netbooks, you may have noticed a lack of numeric keypad with your particular model. You could probably get a USB numeric keypad if you really wanted one of those, but you are probably going to also have to purchase a mouse. Why not combine those purchases with the Adesso 19 Key USB Numeric Keypad? In addition to having the number pad, the mouse has 1000 dpi resolution. When I tried it out, it was a lot smoother than my usual mouse. 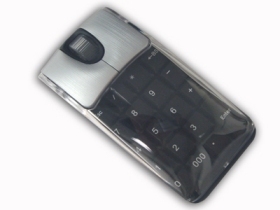 The keypad has a transparent cover that flips up when in use, and closes conveniently when not needed. The keypad is perfect for quick calculations on the Calculator program, or for more complex accounting calculations for Quicken or Microsoft Money. As an added bonus, it has a glowing scroll wheel. The Adesso Keypad mouse is completely driver-free, so it plugs right in, and it is easily recognized. My only complaint is that I’m not certain why Adesso has a “000” button on the keypad, as I would have put a “00” button there. I used to work at a bank, and if you can hit “00” instead of one zero, it saves time. However, I rarely had to input three zeroes. Clearly, this keypad is made for some big money makers. The Adesso 19 Key USB Numeric Keypad can be purchased from the Adesso site for about $27.99.